Fresh fruit is an immaculate gift. The gentle resistance of a cherry's skin beneath the teeth; the dense crispness of an apple; the coy seduction of a fig. Fruit is the original fast food — ready and nutrient-dense, thoroughly pluckable, and easy to love. To see an apple tree so laden with fruit that its branches buckle is to witness one of nature's finest works of reproduction. The tiny tree that bears big fruit. Ripe fruit marks the changing seasons, perhaps more reliably even than the weather. It is the thread that we dangle upon as we listen hesitantly to news of late frost, drought, or hail. It has the rare ability to make us forget decorum as we slurp at the errant juices of a peach or spit watermelon seeds over our shoulders. Fruit evokes some of our strongest emotions. The sadness of an apple orchard in autumn, with its hanging branches and burnished color, the apples thudding as they fall, keeping time. A lovely sadness. We have been taught to call it nostalgia, but it is a sort of sadness all the same. Then there are the riotous red berries of spring that taint our fingers, clothing, and smiles. Is it possible to be sad while eating a ripe red strawberry — ripe all the way through? And yet we settle for fruit that has no business bearing the name. I have, as I imagine most in my generation have, eaten my fair share of cottony strawberries and tasteless apples. I have purchased peaches that, if thrown properly, could stun an elephant. I have bitten into inky purple plums and come away with a mouthful of bitterness. Such fruit is made edible by sugar and butter, but it is not fruit as fruit should be in its finest hour. Suffice it to say that this genre of fruit is in my past. Trying to eat only local fruit presents its problems, depending on where you live. When we visited the Pacific Northwest this summer, fruit was abundant, and for a pittance. When we returned home, I managed to find half-pints of local raspberries for sale at $7 apiece. What is real fruit worth, anyway? A question for a food philosopher, no doubt. And so I have tried to make peace with the fruit I can find here. I squirreled away rhubarb during the two weeks it was in season. I bought strawberries, made jam, and froze what I didn't have time to can. I've tucked away blueberries and what blackberries I was able to find on the hillsides and edges of fallow fields. There have been bushels of peaches to come through my kitchen, and they lie, sliced and cubed, in the freezer. It is difficult to improve upon ripe fruit. Therein lies my dilemma. As a baker, I find it impossible not to tinker with ingredients. And in my opinion, there is no better way to gild the lily than with ripe fruit. A couple of shortbread cookies and a handful of bright, juicy strawberries, or a square of dark chocolate and a bowl of raspberries — that's the basic principle. I wanted to take this philosophy of simplicity and couple it with a baker's ingenuity to create honest fruit desserts. At my day job, I work for the Joy of Cooking as a recipe tester and developer, and recently I've been testing a plethora of fruit desserts. There are many exquisite and oft-overlooked fruit desserts in the Joy of Cooking, and I hope to shed some light on them here. I tweak almost every recipe I test in the belief that a good thing can always be made better. Sometimes this involves omitting something, streamlining the recipe, or adding something complimentary. All the recipes described below are my interpretations of Joy recipes. One of the things I learned on my fruit journey is that roasting fruit is almost always a good idea. Strawberries become garnet flavor bombs. Apples shrivel into soft, syrupy beds for whipped cream and cinnamon. Figs become silky and full. In a sense, fruits come into their own when roasted. They become more than they are — at once bolder and more subtle. This is especially true where peaches are concerned. In July and August, peaches are sold by the half-bushel basket on the side of the road and at farmers markets. I've eaten my share of raw, unadulterated peaches this summer, and all of them have been fabulous. But at some point, you start to improvise with the bounty around you. I made the obligatory peach pie to start. Then I struck recipe gold. Baked Peaches is a fruit dessert at the height of its powers. 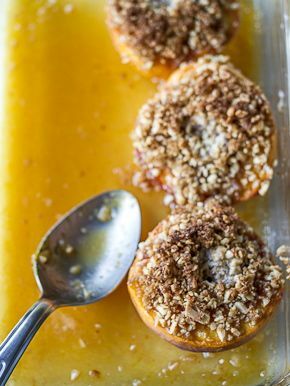 The unctuous flesh of baked peach pairs with a crisp, toasted-almond topping and the subtle tang of orange juice. There are lots of directions you could go in with this concept. Use apricots instead of peaches. Use hazelnuts or walnuts instead of almonds. It's not a groundbreaking recipe, to be sure, but most of my favorite recipes aren't groundbreaking (e.g., roast chicken). 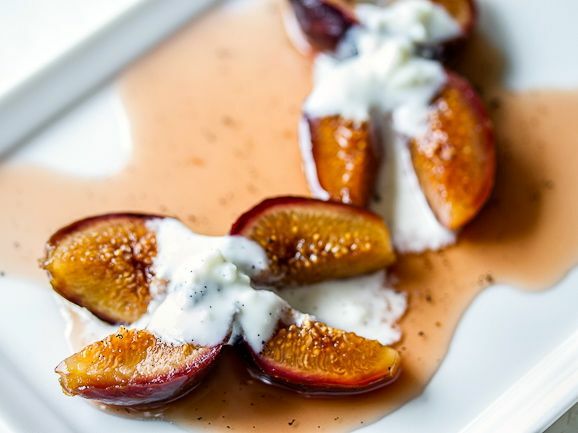 Another dessert on a similar theme is Oven-Poached Figs and Ricotta. Figs are halved, then poached in a marsala-rich syrup. Once out of the oven, they are topped with a ricotta mixture and a little grated dark chocolate, if the fancy strikes you. The process is beyond simple and yields a dessert perfect for the end of a heavy meal. Or you could pair the figs with a thin slice of dark chocolate cake. I've even been spooning the leftovers onto my morning oatmeal. The roasting principle is almost universally applicable to fruit. The only common fruit I haven't tried to roast is watermelon, although I've had a measure of success with roasting cantaloupe. Unless a fruit is very juicy, however (such as cantaloupe or strawberries), you'll need to provide a buffer between the fruit and the dry heat of the oven. Otherwise, you risk simply drying the fruit out — which can be OK, but I prefer more succulent results. In the case of the roasted, almond-topped peaches, the buffer is the orange syrup and almond topping. They both help to seal in and condense the fruit's natural juices. In the case of the figs, the buffer is the marsala syrup. 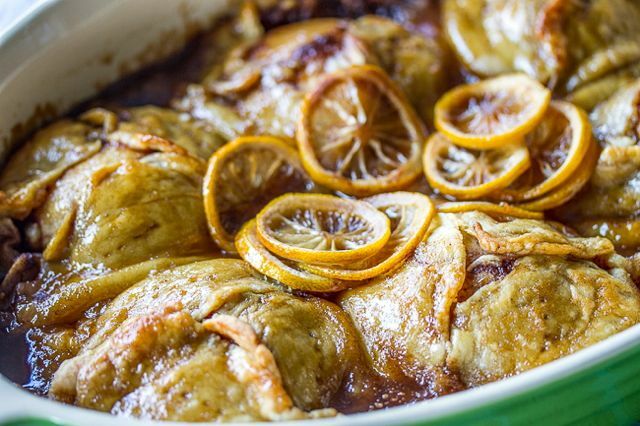 For my next dessert — apple dumplings — I used a rich pastry dough and a lemony syrup as a luxurious buffer to create a beautiful and devastatingly delicious dish. As a North Carolina girl, apples are a big part of my autumnal culinary lexicon. Every fall, apples are abundant and cheap, and they come in dozens of varieties. Apple butter is the standard thing to make from them, and I usually make two or three batches while apple season is in full swing. After that comes applesauce (for those weary of the hours and hours of stirring that apple butter entails). Old-timers will dry apple rings for use in apple pies and (one of my personal favorites) fried apple pies. However, there are plenty of other apple desserts for those willing to experiment, and many of them are the essence of simplicity. Apple dumplings happen to be the one I succumbed to. In this classic dessert, apples are cored and left whole or cut in half and wrapped with a brown-sugar mixture in pastry dough. They are then baked and basted with a sugar syrup. When I first made apple dumplings, I didn't expect to be impressed. 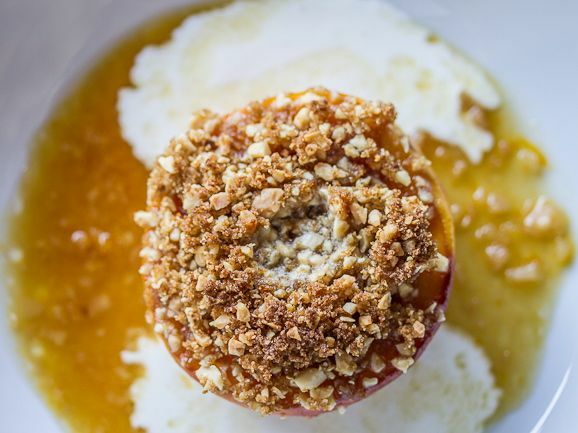 When it comes to notable fruit desserts, apple-based ones don't typically come to mind. Perhaps this bias is due to the fact that apples are so ubiquitous in the southern Appalachian region that I don't think of them as a treat. I've also been burned by grocery-store apples so many times that I may be a bit jaded. In any case, I was not prepared for how delicious apple dumplings were, but after devouring a whole one before dinner, I was prepared to sing their praises forevermore. This is not a dainty dessert. It is hearty and old-fashioned and thoroughly wonderful. It almost sounds like conspicuous excess even to mention vanilla ice cream or whipped cream, but one of the two is in order. A cream-based addition helps to cut through the sticky sweetness and makes the whole experience more richly textured. In light of this, you may wish to just have one of these instead of dinner, rather than as a finale. Whatever you choose to do with fruit, do as Alice Waters instructs in her beautiful book Chez Panisse Fruit: taste critically. Before you use fruit of any stripe, taste it. Is it sweet? Sour? Juicy? Dry? If you start with the best fruit money can buy, you'll want to treat it very simply, or not at all. If you have less than perfect fruit on your hands, there are plenty of directions you can go with it.